Play on the piano, try out the drums, join the open mic session, or come and busk! Or if you just want to listen to some great music making, we’d love you to take part! 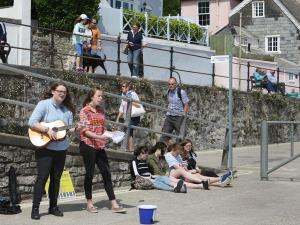 The popular annual B Sharp Busking Festival is on Saturday 25th May. For 7 hours between 11am to 6pm the streets will be alive with the sound of music. A vast selection of new, exciting local musicians and street artists will be performing. B Sharp’s talented musicians will be on hand to guide. No matter what your level of music ability is, the team is encouraging people to have a go. Play on the piano, try out the drums, join the open mic session, or come and busk! Or if you just want to listen to some great music making, we’d love you to take part! BUSKING: 11am – 6pm. All along the seafront, in town, shops, pubs, cafes.